Are we alone? It’s a question that remains unanswered now for thousands of years, and given the vastness of space, it will only be answered with extraterrestrial contact—otherwise every uncharted nook of the universe could be harboring alien life. But are the tens of thousands (or more?) eyewitness reports and video/photographic evidence just theories? What about the countless military personnel who risk reputation and rank to testify on the shocking UFOs they’ve seen—so much so that some of them even convened at the National Press Club to discuss the matter? You can watch a video interview with the Admiral here. With all the of the documented incidents, one particularly fascinating moment was witnessed by roughly 1 million people in Los Angeles in 1942. The UFO was, understandably, seen as a threat since it had only been 3 months since Pearl Harbor. When multiple people end up dead and the United State military is forced to respond with violence, you know this isn’t just some fake news hoax. “The two of us stood side by side in front of the house, huddling together in the chill night air and staring up into the sky. 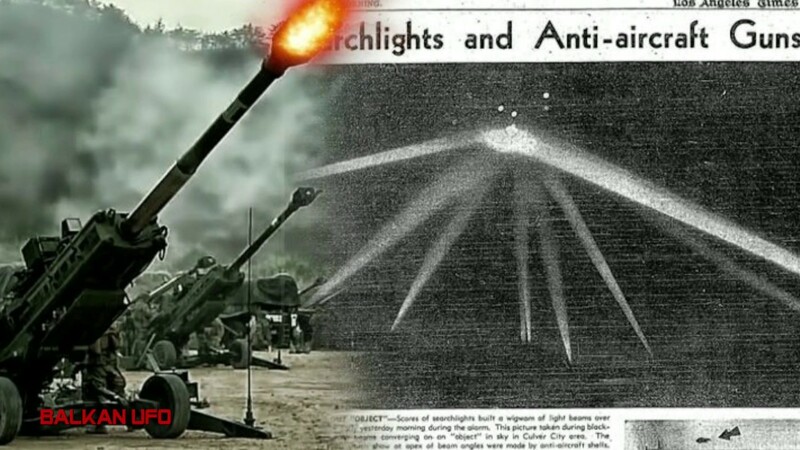 “The planes we’d heard were not in sight, but what captured our rapt attention was a silvery, lozenge-shaped “bug,” as my mother later described it, that was clearly visible in the searchlight beams that pinpointed it. “Although it was a clear, moonlit night, no other details could be discerned, despite the fact that, when we first saw it, the object was hanging motionless almost directly overhead. “Its altitude is hard to estimate, especially after all these years, but I’d guess that it was somewhere between 4,000 and 8,000 feet. Although the government ultimately tried to deny the incident by describing the UFO as anything but extraterrestrial life, many people are not so convinced.